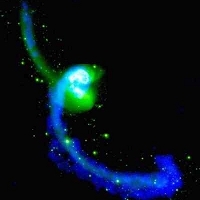 We study a wide range of cosmic structures, from individual galaxies through galaxy groups and clusters to superclusters, using a combination of multi-wavelength observations (radio, IR, optical, UV and X-ray), advanced analysis techniques, and cosmological simulations. 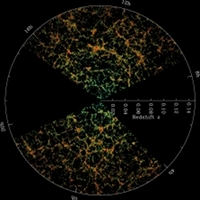 Special features include our interest in the distribution of hot gas and dark matter in cosmic structures, linking observations with state-of-the-art simulations, and developing/applying new algorithms for astronomical data analysis and mining. We host a regular Extragalactic Workshop with colleagues at the University of Nottingham. Understanding the formation and evolution of galaxies is one of the main aims of modern astrophysics. We have special interests in the formation of galaxy discs and halos, the influence of environment on the evolution of galaxies, and the distribution and properties of active galaxies, which host supermassive black holes. 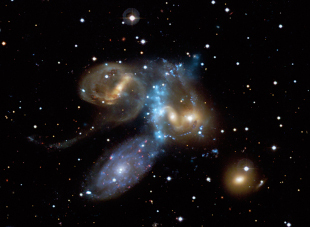 Many galaxies, including our own, are located within galaxy groups. We have an extensive programme studying the properties of the hot gas, dark matter and galaxy populations in groups from the Local Volume around the Milky Way to the most distant groups yet detected. The properties of the hot gas within groups provides a sensitive probe of cosmic feedback. 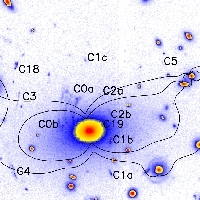 Clusters of galaxies are the largest stable structures in the Universe and are therefore important cosmological probes. We use gravitational lensing to study the distribution of dark matter which dominates their mass, coupled with X-ray observations of their hot gas and multiwavelength studies of cluster galaxies, which are strongly influenced by the cluster environment. Galaxy clusters are multi-faceted probes of cosmology because they are sensitive to the properties of dark matter, the pace of expansion of the universe, and the rate at which cosmic structures grow. We have keen interests in probing dark matter, dark energy, and gravity theory with clusters, linking closely with our multi-wavelength studies of cluster physics. 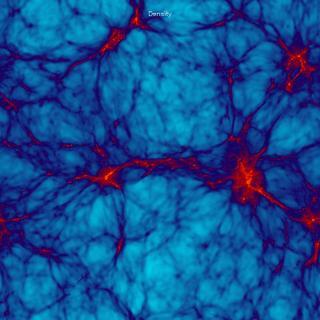 The massive computing power now available makes it feasible to simulate the development of large regions of the Universe - following the growth of structure driven by gravity. Dark matter is relatively easy, but the complex physics affecting atomic matter makes it much more challenging. One of our basic aims is to test our physical prescriptions against observations so that models can be improved. Large archives of astronomical data (images, spectra and catalogues) are an increasingly important feature of modern astronomy. 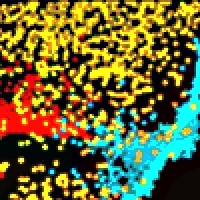 We develop and implement innovative algorithms, based on advanced statistical techniques and elements of machine learning, for fast, automated analysis (e.g. classification, clustering, vsualisation) of large datasets of high dimensionality.